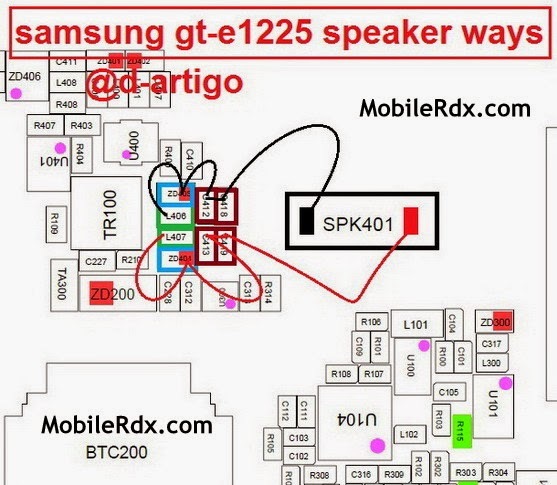 In this solution shows the connection line paths of the Samsung GT-E1225 speaker and its components. You can use this to troubleshoot if the there is no any audio can be heard over the speaker, like ringtones, music and in loud hands free mode. You may locate the components that I highlighted on below picture and check that certain area for possible damages might occurred. The speaker is replaceable and fixing this kind of problem was not that much hard enough. This problem may only sometimes happens if the device suffered wet damaged and or accidentally heavily dropped. 1. Check the IHF speaker assembly for possible damaged and or misaligned. Use a multimeter to check i, replace if already busted. 2. If the speaker is okay, check and clean the speaker terminal contact pads. Corrosion might weakened and loosen the connection. 3. Trace the speaker+ and speaker- connection to each certain components where it is being connected. 4. Check and replace the filter capacitor and resistor components.